What does Seattle’s lawsuit against the Trump administration mean for us? 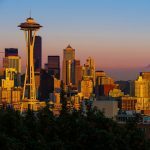 On March 29th, 2017, the city of Seattle filed a lawsuit against the Trump administration for threatening to withhold federal grant money from cities like Seattle, who don’t comply with enforcing federal immigration laws. YES! Magazine’s Susan Gleason and James Trimarco get into the history of Sanctuary Cities and the lawsuit’s possible outcomes.